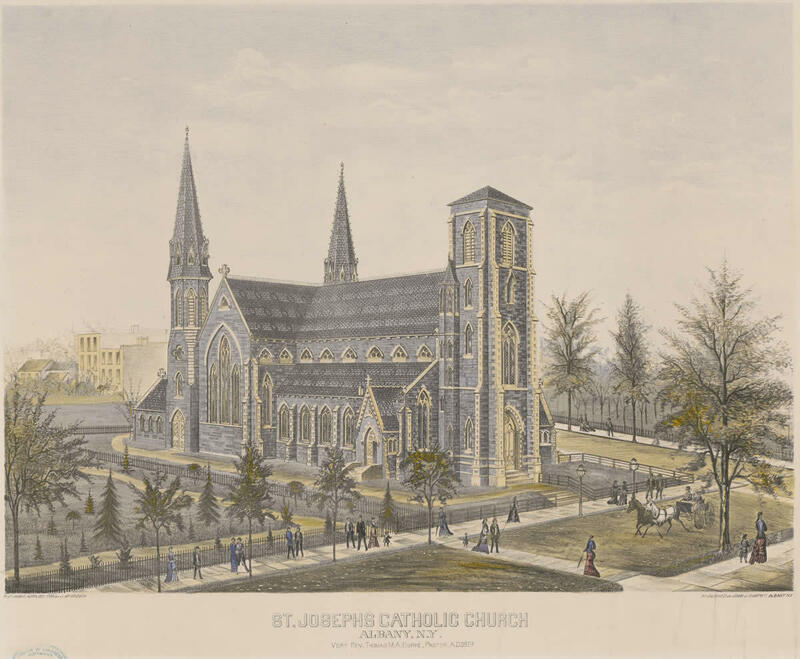 We were flipping through local images in the Popular Graphic Arts online collection at the Library of Congress (as one does) and came across this nice 19th century illustration of St. Joseph's in Arbor Hill. It looks like it was created in 1879, about two decades after the church was built. The church's main spire -- that is noticeably missing from this illustration -- was apparently added in 1910. St. Joseph's was designed by Patrick Keely, who was also the architect of the Cathedral of the Immaculate Conception just across town. There also happens to be a 19th century illustration of the cathedral in this collection, too. The church still stands today, of course, though it continues to wait for its next life. Completely unrelated: The Popular Graphic Arts collection also includes a "porcineograph" of the United States -- that is, a map of the US in the shape of a pig -- from around 1876 with the foods for which each state was said to be famous. New York's notables: "Roast Pig, Fried Oysters, Strawberry Shortcake, & Uninvestigated Drinks." Yes, uninvestigated drinks. Quite a few churches in this city were designed for spires that were never constructed - others lost theirs over time. One church over on Livingston Avenue had the foundation dedicated in 1917....and to this day nothing more than the basement was completed. This is awesome. Look at the young trees! The walkers strolling down what would become Ten Broeck street! I have a pretty cool print of this church from the fifties and the street had a median and diagonal parking. I love how history can provide us with ideas for returning to a more pedestrian friendly way to enjoy this beautiful spot.